SURRENDER is the sequel to POSSESSION (read my review). A few minor spoilers for POSSESSION follow, so skip down to the giveaway if that bothers you. As the director's daughter, Raine has experience in towing the line, so when Gunnar, an especially talented citizen (he's a technopath, empath and can compel people with his voice) is called in to train with her father, Raine recruits him for the Insiders (a group of rebels). Jag and Vi's romance in POSSESSION came on super-fast and strained believability at times. Raine's relationship with Gunnar develops more slowly and organically. We get alternating chapters from both POVs, so it's clear early on that they have crushes on each other, but they don't get together instantly. A main theme of both books is choice, and both Raine and Gunnar are promised to others (Cannon and Starr respectively), so their love is absolutely forbidden. Still, we want to believe that love can conquer all don't we? Everyone in this society seems to be playing both sides, so just when you think you might have a handle on what's going down, things change. Never a dull moment in this high stakes society! 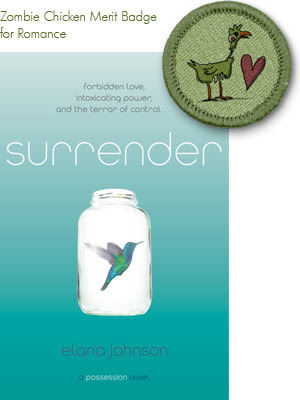 SURRENDER is available in hardcover now. Find out more about it at the author's website. I have 5 prize packs to give away that include the paperback of POSSESSION (which you do want to read first) and the SURRENDER hardcover. To enter, fill out this form by Sept 9th at 11:59 pm CST. US and Canada only. 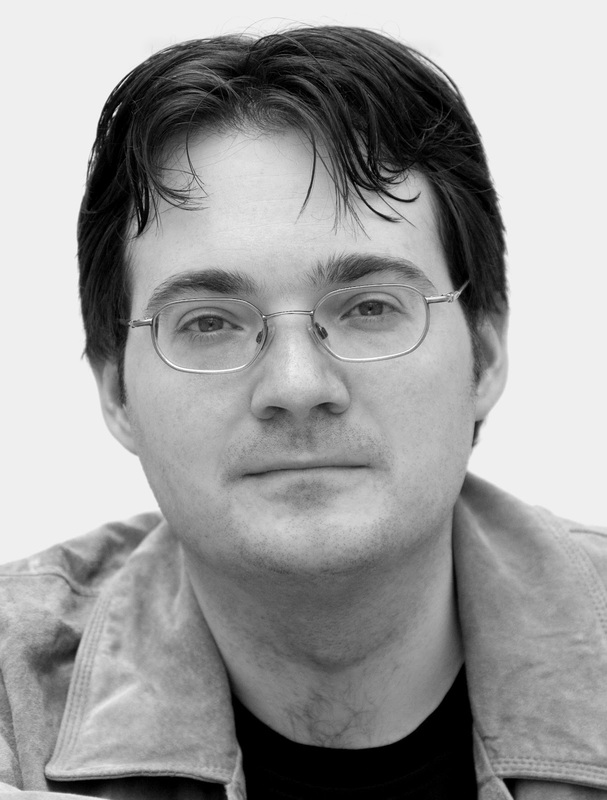 Today I have MISTBORN Author Brandon Sanderson here to talk about STEELHEART his new YA due from Delacorte (Random House) in August 2013. My name is David Charleston. I'm not one of the Reckoners, but I intend to join them. I have something they need. Something precious, something incredible. Not an object, but an experience. I know his secret. One of the reasons that we read is for the sense of catharsis we get from seeing something go terribly wrong and watching people deal with it. It's just one of our basic needs where stories are concerned. From the beginning we have liked dark stories, starting with the oldest fairy tales and even earlier. They do serve a cautionary role, but there's also a fascination to them. What would we do if we were in those terrible circumstances? What will these characters do? In some ways dark stories are optimistic, because we get to see people struggling to deal with terrible situations and then hopefully coming out for the better. I think I would say Peter Parker. In Steelheart, David lives in a world where people gain super powers but only evil people have them. It would be one of his dreams to find people who were super-powered, yet were also good. Plus David's kind of a nerd in his own way—he's a nerd about super powers. He doesn't consider himself one, but he's studied super powers for most of his life to try to figure out how they work and how to defeat them. So I think he and Peter Parker would get along well. These are in no particular order. 1984 has to be on the list; it was the first big dystopian book that I read, and it has shaped this genre, in a way. I would put up there The Giver as well, which most people count as dystopian; it's kind of an interesting blend of dystopian and other sub genres, but I enjoy it. Among more recent fiction, I would say Uglies by Scott Westerfeld, and The Maze Runner by James Dashner, for something very recent. Finally, another good classic—probably my favorite of all time is Harrison Bergeron by Kurt Vonnegut. Finish all these darn books I want to write. I have around two dozen that need to get done before the world ends, so I'd better get cracking. That's an excellent question. This is a somewhat crowded genre recently. Of course, dystopian fiction has always been popular in the SF/fantasy field, but lately it's had quite a boom. I am the only one that I know of doing a superhero apocalypse. I wrote the book because one day I was driving down the road and someone cut me off in traffic, and I thought, "It's a good thing I'm not a supervillain, because I would totally blow up your car." The what-if for me on that was—what if someone could just blow up your car if you cut them off in traffic? How would that change the world? What would we do if people started getting super powers and just started taking whatever they wanted? Would we be able to stop them? What would happen if the government just declared them forces of nature, acts of God, something that can't be changed. It was an interesting enough premise that I wrote a book based around it, and that's where Steelheart came from. It's a premise that I haven't seen done before. 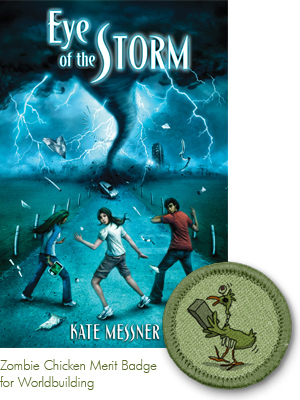 EYE OF THE STORM is available in hardcover now. Find out more about it at the author’s website. 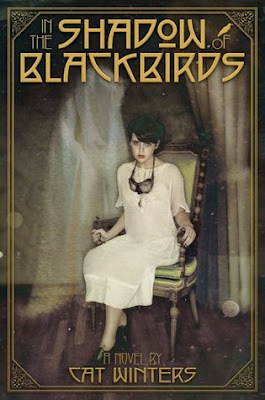 Today I have Cat Winters on the blog to preview her historical dystopian IN THE SHADOW OF BLACKBIRDS. It releases from Amulet Books in Spring 2013. I am definitely excited to read this one as it is a scary yet fascinating period in American history. A teen girl mourns the loss of her first love in 1918 California, where a flu has turned deadlier than a world war, disloyalty is forbidden, and spirit communication has become a dark and dangerous obsession. I think we enjoy dark tales because we want to see how other people survive the absolute worst situations the world can offer. I would never want to go through the terrifying, grueling experiences my favorite characters endure, but it always gives me a tremendous rush of hope to watch them overcome the darkness bearing down on them. I think society as a whole is especially drawn to tales of young people overcoming the darkness. Not only do children and teens represent the possibilities of a new future, but they tend to be more honest about the cruelty and ridiculousness of overwhelming situations. 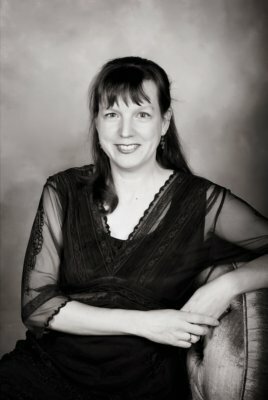 "Doomsday Serenade" by Jill Tracy (http://jilltracy.bandcamp.com/track/doomsday-serenade): a ragtime-influenced love song set during the Apocalypse. It's perfect for my two main characters, who desperately try to remain together during a moment in time when the world truly did feel like it was ending. I won't even get into the fact that one of those characters happens to be dead. Hmm…that's a hard one. I suppose my main character would get along well with Lina from Ruta Sepetys's BETWEEN SHADES OF GRAY, another dark historical novel that almost feels like it's set in a dystopian world (at least, I wish that world had only been imaginary and not a real place). Both girls are fighting for survival under dire circumstances they can't control, and they're both smart girls with potential who watch their chances for a bright future crumble around them. My protagonist would certainly be empathetic to Lina's experiences. NINETEEN EIGHTY-FOUR by George Orwell - It was my first introduction to dystopian literature, and the Big Brother concept definitely influenced my portrayal of IN THE SHADOW OF BLACKBIRDS's overbearing 1918 setting. My main character is the daughter of a man who's beaten and arrested for thinking the wrong ideas, and she's constantly reminded that people could be listening and watching for her signs of betrayal to the government. THE HANDMAID'S TALE by Margaret Atwood - I was blown away by the intensity of this book. I remember being a little freaked out because shortly after I read the novel in college in the early nineties, we all started using credit cards to buy groceries, gas, etc., just like in THE HANDMAID'S TALE. Before then, we were mainly using cash and checks, so it was disconcerting to move one step closer to Atwood's fictional world. FAHRENHEIT 451 by Ray Bradbury - The idea of burning even one book makes me shudder. The concept of a society that burns ALL books is pure dystopian horror. I've been a Bradbury fan since childhood. in history that was a true dystopian society. Portray it that way." Something about Collins's novel and the juxtaposition between The Capitol and Panem's citizens allowed me to start seeing my own book's setting as something that could have emerged from science fiction. My two central teen characters are even science fiction fans, which seemed appropriate for a young couple immersed in a bizarre dystopian reality. LORD OF THE FLIES by William Golding - I know there's some debate over whether or not this is truly a dystopian novel, but this book is the epitome of how fear and chaos can create a nightmare society. The fact that children are involved in creating that society makes the book all the more chilling. Visiting as much of the world as I can. When I was nineteen, I had the opportunity to study theater in London for five weeks, and I thoroughly enjoyed the experience, but that's the only time I've left North America. I'd love to see more of what's out there. IN THE SHADOW OF BLACKBIRDS is historical fiction, a genre not typically associated with dystopian literature, mainly because dystopians are usually defined as having purely fictional settings. As I mentioned above, however, a Big Brother/apocalyptic mood pervades the entire novel. I'm guessing many people unfamiliar with the history of 1918 may even believe I created the monster flu at the center of the story, as well as the book's oppressive U.S. society, which at times resembles Nazi Germany and paranoid Cold War nations. I think readers will see from the very opening scene they're in store for a historical American world that feels unfamiliar, unsettling, and definitely dark. I adored the worldbuilding of CREWEL. To take such a fantastic concept (everything that exists is woven into the tapestry of life - and can also be unwoven and restitched) and make it so tangible to the reader is an amazing feat. The world of Arras is very Mad Men-esque, with its fancy clothes, political maneuverings, men-dominated society and constant alcohol consumption - but is also very dystopian. Control is of the utmost importance, and to gain it, the Guild will use anyone and everyone as pawns to prove their points. Whole sections of the weave of Arras are ripped (wiped out without a trace) just because the leaders feel like it. Inhabitants are reset after such changes so that, for example, if one of your children is taken from you, you might be rewoven to believe that this child never existed at all. How very creepy! 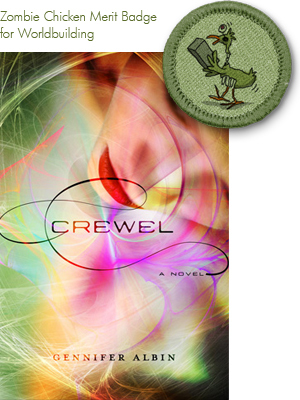 After the BANG ending of CREWEL, I'm interested to see where the sequel goes. And because Gennifer is an Apocalypsie (Debut Author 2012), we also get an Apoc Love interview to discover what Gennifer loves most about her own creation! I have to admit there is a kissing scene I'm rather fond of. One agent said it was the best kissing scene she'd ever read. Romance is not a huge element of Crewel, but I hope the scenes that include it pack some punch. The loom rooms, because it was tricky to get right - and I'm still not sure I did get it - but I think the looms and how they function, what they do and look like were my most ambitious writing in the novel. I think Cormac Patton could have his own sci-fi Mad Men spin-off. I'd love to see how things work in his head. I have to say that getting to meet people who've read my book just because they wanted to is my favorite part. It's lovely to hear your sales and marketing people like the book, it's wholly different to hear that from a reader. CREWEL doesn't come out until October 16, 2012, but I have one ARC to give away to today to a reader anywhere in the world. Enter via this form by Sept 7, 2012 at 11:59 pm CST. Find out more about the book at the author's website. Peggy Eddleman is here today to preview her debut middle grade novel THROUGH THE BOMB'S BREATH, due from Random House in Fall 2013. Twelve-year-old Hope Toriella lives in a town of inventors struggling to recover from the green bombs of WWIII that wiped out nearly all the earth’s population. Inventing has made life possible in White Rock, and it’s how the town views a person’s worth. But Hope would much rather sneak off to cliff dive into the Bomb’s Breath— the deadly band of compressed air that covers their valley— than fail at yet another invention. When bandits find a way into their protected valley, they invade. With a two day deadline to hand over their medicine that cures the deadly Shadel’s Sickness that has run rampant since the bombs, the town is left to choose whether to die from Shadel’s over the next year, or die fighting the bandits now. Inventing won’t save them, but the daring and recklessness that usually gets Hope into trouble just might. Because they make us stronger. A lot of times, the things that happen in “dark” stories are much worse than we’ll run into in real life. When we experience hard things in a book, we go through them emotionally, and as we deal with them, it makes us emotionally stronger. It helps us deal with the darkness in our own lives better. Plus, we like to know see people overcoming huge things. We like rooting for the underdog! We like to know that when things get really tough, we can come out on top, too. I’m going to go with Change by Taylor Swift because the song is all about being outnumbered and the fight not being fair, but finding your strengths and using them. And not walking away. That even when history seems to always repeat itself, you can still change it. That even when everything seems against you, you can find a way to win. I love Divergent for the sheer genius of the factions. Plus, we get to live in what is arguably the most action packed faction of them all. I’m a sucker for a daring MC. Because I love the sci-fi elements, and the alternating narrating characters are so good! And I love that everything isn’t wrapped up nice and neat with a bow on top in the end. Okay, so this is a fantasy, but it has such strong dystopian elements! Controlling government: check. Oppressed people: check. Someone to rise above and be strong enough to take on said controlling government: check. Plus, the inventiveness BLEW ME AWAY. I’m kind of in love with this book. Because I wanted to drink in all the words. So beautiful! And such fabulous character development. This book (and series!) will always remain in my top five of all time. I love its subtlety, its heart, the richness of the world, and the complex character relationships. To travel! My hubby and I have especially wanted to see the castles of Scotland. And we really want to go while our kids are still living at home. I’m not about to go somewhere I’ve been dying to see, and just wish my kids were there to see it with me the whole time! We’d definitely go as a family. It doesn’t have a controlling, oppressive government— one of the main problems is that there’s a lack of government. (Which, I guess is to be expected when there aren’t very many people left on the Earth!) But the lack of government means that bandits are a huge problem. Another thing that makes my novel stand out is that my main character does not come from a dysfunctional family. Her parents are genuinely good people, which is kind of a rarity in kidlit. And of course there’s the Bomb’s Breath— a band of deadly, pressurized air hovering over the land, and my MC realized she can sneak off and cliff dive into it. The Bomb’s Breath is one of the funnest things I’ve ever written. Orphan Alenna Shawcross has never really felt at home in the UNA, but she still never expected to be sent to the Wheel – an island prison for kids who don’t pass the government’s personality test. Life expectancy on the Wheel is short, but Alenna is rescued by a warrior girl named Gadya who takes her to the island’s only autonomous colony (every other part of the island is controlled by the mysterious Monk, worshipped as a God by his large army of drones). In the colony, Alenna meets Liam and joins up with a group of hunters who are on a mission to find the truth at the heart of the island. 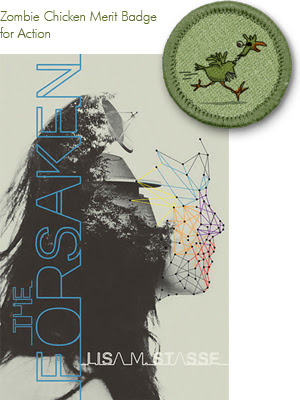 FORSAKEN gets the Zombie Chicken Merit Badge for action because the pages teem with well-executed fight scenes. There’s a palpable sense of danger – and no characters are safe. There are also quite a few nice surprises, such as the identity of the Monk and the real purpose of the Wheel. 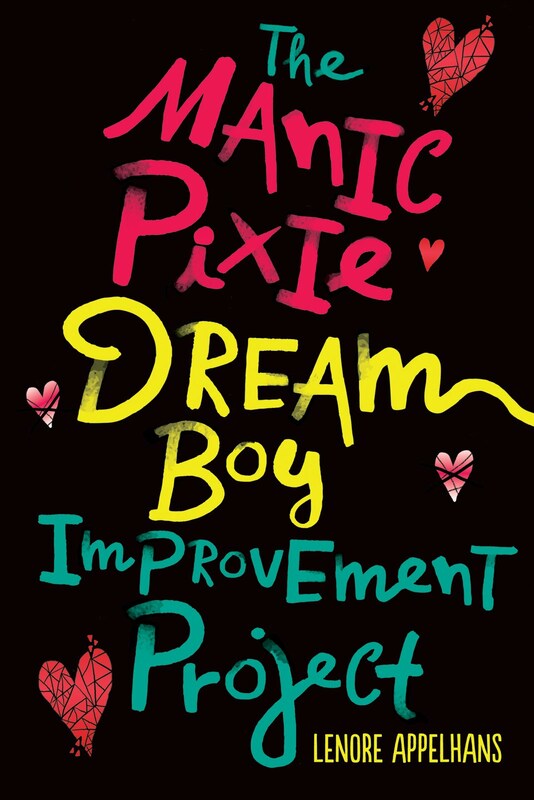 Alenna has a definite case of insta-love for Liam, but the romance element is very toned down here, making this a good recommendation for boys who enjoyed THE HUNGER GAMES and/or LEGEND (Marie Lu) and are looking for a read-alike. THE FORSAKEN is available in hardcover now. Visit the publisher's website for more information. I have 5 copies for readers in the US and Canada (courtesy of the publisher) and 1 copy I can send internationally (donated by the author). To enter, fill out this form by September 4, 2012 at 11:59 pm CST. 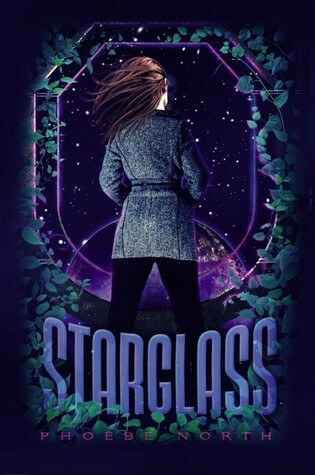 Today I have Phoebe North here to preview her debut novel STARGLASS, an epic tale of rebellion set on a generation spaceship - blasting off from Simon & Schuster Books for Young Readers in 2013. I think darkness is a natural part of life. As much as I love fluffy happy stuff (in music and video games, particularly), I think the best artwork is at least a touch bittersweet. Part of this might be influenced by my own childhood, during which my father died, but I've realistically always felt like death and loss were a part of being human. Darkness can help us better feel the poignancy of a given moment, the complexity of a human emotion, or the fleeting nature of our own lives. That might sound, on the surface, a bit depressing, but it's not--it's just part of the fabric of being human. Great question! I'm a big fan of the classic twee-pop band Tullycraft, and I've always felt that their song, "The Lonely Life of a UFO Researcher" does a great job of encapsulating Terra's emotions during Starglass. Because her life has been so carefully laid out for her while on the ship, all of her hopes and optimism hinge on experiences she's not yet had--reaching Epsilon Eridani, colonizing the planet the ship's inhabitants have come to call "Zehava," seeing the sky for the first time. Like the UFO researcher of the song, she has evidence that these things might come to pass, but it's still difficult for her to have faith sometimes. In that way, she's like many kids who yearn for something more outside of their hometowns. You know, my impulse is to say Dicey from Cynthia Voigt's Tillerman Cycle. There's a lot of Dicey in Terra--they've been irrevocably shaped by their experiences but are, at their core, survivors. Yet despite their similarities, I'm not entirely sure that Dicey and Terra would actually be friends. They're a bit scrappy, and both of their defenses are up pretty high. And that's true for many of my favorite fictional characters--Mary Lennox, Meg Murry, Holden Caulfield, Tris Prior. That being said, I could actually see Terra getting along pretty well with Diana Peterfreund's unicorn hunters. One of the things I most admired about Rampant and Ascendant is the strong bond between the girls, how they help one another learn and grow--both into warriors and into women. Terra hasn't had much of an opportunity for that in her life, and I think it would be great for her. My top recommendation in the genre isn't YA at all, though it does feature a young protagonist. My absolutely favorite book is Russell Hoban's Riddley Walker, about a boy in a post-apocalyptic society whose father is killed, and who goes on a journey with a pack of wild dogs to discover the truth in his society. All of that might sound pretty standard, but Riddley Walker is, like A Clockwork Orange, told in vernacular. The language is incredibly dense and at times very difficult, but the pay-out is huge for readers who can make it through this sophisticated little book. Otherwise, my top five would be full of titles familiar to YA readers: I thought Under the Never Sky was great fun, absolutely adore Beth Revis's Across the Universe, enjoyed the complex world of Jodi Meadows' Incarnate, and thought Kat Zhang's recent What's Left of Me was beautifully written. I have dreams of someday owning a home with a huge library, the kind you see on Pinterest boards. I'd love to have that ready before the end of the world so that I can have plenty of reading material to keep me busy. Readers should know that I'm a sci-fi geek and a worldbuilding junky. I never set out to create a dystopian society, but when you have a setting like a generation ship, where the population would have to be regulated over generations and where a strong government would need to keep the peace, it can happen pretty organically. The world of the generation ship Asherah is, like many dystopian worlds, one of arranged marriages and stringent societal controls. But once I had laid out the groundwork for that, I saw an opportunity to address some of the identity and rights issues which are present in our own society which many dystopian novels don't. To say much more would be spoiling, but I can say that there's political commentary present in Starglass--which was a risk, but an important one for me to take. Generally, Terra's journey (over both Starglass, and its sequel, which will come out in 2014) is one that takes her from black and white thinking to a morally gray area. Though she--and I--don't agree with everything that the ship's high Council has done, all of their decisions really were made for the aggregate good of the ship and their future colony. Which means that ultimately, Terra is forced to make some really difficult choices herself. DIVERSE ENERGIES is an anthology of 11 short stories that have a post-apocalyptic bent and feature POC characters. As in all story collections, there were some standouts and some I liked less, but every author had something valuable to say about the human experience and how we all strive to survive no matter our race or gender. My top three were: Blue Skies by Cindy Pon, Good Girl by Malinda Lo and Solitude by Ursula Le Guin. The first two hold the promise of being able to sustain a much longer work (much like how Holly Black’s short story “The Coldest Girl in Coldtown” is now going to be a novel) and the third I felt was just the right length and left me satisfied without wanting more. Blue Skies starred a “want” who kidnaps a “have” in order to ransom her for the money to become a “have” himself. In this future, the rich have developed body suits with helmets that they wear everywhere so as to not be exposed to the horrible pollution that kills a “want” by his or her 30th birthday. The criminal and the captive have a day together in his mountain hideout where they connect over the shared desire to see blue skies. Both are yearning for more than their current existence allows – and I would love to see where such a relationship could go in the context of their broken world. Good Girl takes the stereotype of the studious “good” Asian girl and turns it on its head. Interestingly, like Blue Skies, Good Girl is about a criminal but from the opposite perspective (that of the “victim” who falls for the criminal). It is set in a future walled-off New York City, thought by the inhabitants to be the last inhabitable city on earth – but what if there is something more out there? Solitude is about a mother who is so obsessed with studying the strange culture of a primitive people (on a future destroyed “earth”) that she loses her daughter in the process. The story is told from the perspective of the daughter who grows up in the culture and gradually takes it on as her own, unable to readapt to her original heritage. Ok and now for a few superlatives for the other stories. Interested? I have two ARCs of DIVERSE ENERGIES up for grabs to readers in the US. Each copy is signed by Cindy Pon, Malinda Lo, and Greg Van Eekhout. To enter, fill out this form by September 4, 2012 at 11:59 pm CST. Prizes provided and shipped by the publisher. 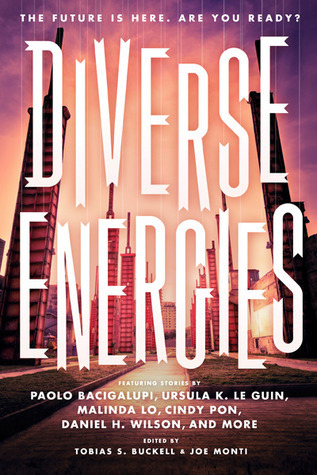 DIVERSE ENERGIES comes out on October 1, 2012. Visit the publisher's website for more information. 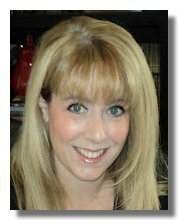 Today I have Debut Author Amy Christine Parker on the blog to talk about THE SILO, coming from Random House in Fall 2013. Now technically it's not dystopian or post-apocalyptic, but it is about a doomsday cult, so I thought you all would want to know about it. Seventeen year old Lyla has grown up inside a deceptively suburban cult compound. She has always been a peace maker by nature, but lately she’s finding it increasingly difficult to stay true to her inner lamb. According to her cult’s leader, Pioneer, the end of the world is a mere three months away. He wants Lyla to “lion up” and help defend the Silo, their elaborate underground shelter, from outsiders looking to survive at all costs. Then she must seal herself inside the Silo along with the rest of the cult for who knows how long while the remainder of humanity perishes and the earth rights itself again. While underground, she will be expected to marry Will, the boy Pioneer’s chosen for her, so she can help with repopulation. Pioneer demands her obedience. Questioning him will only bring swift and harsh punishment. But when the local Sheriff and his son, Cody, show up at the compound’s gate to have a look around, Lyla feels drawn to Cody and to his assurances that the world isn’t really on the brink of destruction. Unfortunately, the closer she gets to Cody, the more she raises the Sheriff’s suspicions about Pioneer, making a confrontation between the two men inevitable. Now Lyla must decide who to believe and how much she’s willing to give up to survive. I don’t know if I can speak for everyone, but I know why I’m drawn to them. I’m fascinated with flawed characters, whether they’re the protagonists, the antagonists, or the supporting cast. I think on some level whenever I’m reading dark stories or writing them, I’m trying to figure out how that darkness grows in people, where it comes from and what triggers it. I also like to see how characters will react under the worst of circumstances. Maybe it also has something to do with facing my worst fears in a safe place, between the pages of a book where the dark can’t actually reach me. It would be Linkin’ Park’s “Waiting for the End to Come”. That song is basically my main character’s thoughts set to music. It gave me chills when I first heard it because it was so much what Lyla was feeling. Lyla would probably have to choose Tris from Divergent because on the surface at least she’s much braver than Lyla and has mad Dauntless skills that would totally come in handy when Lyla goes up against the leader of her cult community, Pioneer. Plus she’s had to defy family in order to figure out where she belongs just like Lyla has to. The Passage by Justin Cronin: Technically an adult fiction choice, but I was never the kind of teenager (or young adult writer) who only reads young adult. I love the scope of this book and the writing is brilliant. Shipbreaker by Paolo Bacicalupi: I’m a Florida girl, so I loved that it takes place along the Gulf and is so well thought out and imagined. The world of this book is intriguing and highly believable, a dystopian that feels absolutely like it could happen. The Forest of Hands and Teeth by Carrie Ryan: Her writing is completely beautiful which is saying something when you’re writing about zombies. Among The Hidden by Margaret Peterson Haddix: It’s been around awhile and is more middle grade than young adult, but I still love this book. I used to read it to my class every year when I taught. It has population police, a love story, and a rebellion. What more could a dystopia lover want? Matched by Ally Condy: She’s up there with Carrie Ryan for me when it comes to her lovely writing. So well written from the first page to the last with another highly developed world that just sucked me in. At the very top: getting a bug out bag full of supplies and an underground shelter somewhere strategic ‘cause right now I’m basically gonna die if the end of the world comes anytime soon. I’m so not prepared for it. BUT I’ve been watching Doomsday Preppers recently so I’m feeling a tiny bit better. At least now I know how to start a fire with steel wool and a battery. After that it’s to see my book on shelves! I have this fear that now that my biggest dream is coming true I’ll accidentally walk off the curb right into an oncoming car(disturbing, I know) or something equally disastrous and people will shake their heads and say, “Poor dear, her first book was due out next year and now this.” Of course it might actually make my book more popular, but I’m just not willing to die for a pity spot on the New York Times Best Seller list, ya know? Well, mainly it stands out because technically speaking it isn’t a dystopian in the truest sense. It takes place in the here and now, not in the future, but I’d argue that because of the way the community in the book runs and the way that the members of it are isolated from the rest of the world, It feels very dystopic as does the main character’s struggle to figure out what she believes in and whether or not she’s ready to fight for the right to those beliefs. Today I have Bethany Hagen previewing her epic debut novel LANDRY PARK which comes out with Dial/Penguin in Fall 2013. Entirely too far away for a book I want to get my grabby hands on right now. LANDRY PARK, pitched as "Gone with the Nuclear Wind,"is set in a world ruled by the lavish Gentry, who force a people called the Rootless to handle the nuclear material that powers their large estates. When a Gentry girl is attacked, sixteen-year-old Madeline Landry can't escape the rumors of revolution and retribution circulating through the ballrooms--and the city's new golden boy, Captain David Dana is at the center of them. Soon, she finds herself forced to choose between her duty and her desires, her ancestral destiny and her conscience. Edward Burke believed that the sublime was rooted in darker emotions like fear and uncertainty, and that the sublime reading experience was one of the highest reading pleasures that could be attained. I think we enjoy that captivation that comes from books that touch upon the sublime via these darker themes. I think we also crave books that force us to examine ourselves. We want books that take us to the borders of civility and conscience, books that strip down human nature to its barest forces. Is love stronger than fear? Than anger? Is love stronger than survival? It might sound silly to think, "What would I do if forced to kill other teenagers on television?" Or, "What would I do if I was forced to burn books for my job?" but there's so much value in asking ourselves about these scenarios. I know my husband and I have had serious conversations about what point it is acceptable to shoot a bitten partner in a zombie outbreak. Oh, goodness. This is hard because I have so many! One of my original theme songs, as it were, was "The Royal We," by Silversun Pickups. I love the sense of urgency within the song and the lyrics are pretty much perfect for Landry Park. I think Madeline and Fanny from Mansfield Park would have a lot in common. They are both very internal thinkers and they both quietly maintain their sense of dignity and integrity in the midst of people who value neither. 1. The Hunger Games because, well, obviously! 2. Brave New World by Aldous Huxley. More than 1984 or Fahrenheit 451, this book--even across eighty years--still presents to me the most prescient analysis of the causes of a dystopia. Why would a government go to the trouble to burn books when people forsake them on their own to have orgies and soma holidays? Or to watch shows about housewives throwing chairs at each other? 3. Tomorrow, When the War Began by John Marsden. This was the first dystopian novel I ever read, and I can still feel Ellie's terror as she discovers her country was invaded while she was on a camping trip with friends. 4. The Handmaid's Tale by Margaret Atwood. I think this broke ground in using the idea of dystopia to shed light on contemporary gender issues, and showing how those issues could cause a society to regress so dramatically. 5. The Children of Men by P.D James. This was one of the eeriest dystopians I ever read, because the world was so close to ours, and yet so chilling in its acceptance of its own imminent death. The book layers personal tragedy over global tragedy and ends with the faintest ray of hope. 5. (part B) Speaking of bleak dystopians with not even the faintest ray of hope, The Road. I wanted a Zoloft afterwards. Visit England, lay on a beach with crystal clear water nearby, and finish crocheting the blanket I started three years ago. I wanted my characters to live lives that were beautiful, pleasurable and leisurely. I wanted a book that combined the feelings in a drawing room with the wars outside (to borrow from Virginia Woolf.) So we have corsets and dashing uniforms side by side with nuclear physics and dehumanizing poverty. I also felt like heroines in these types of novels are often able to make an easy decision (as in, by the end of the first book) about how which side they're willing to take in the upcoming inevitable conflict, even though it takes them THREE whole books to decide which boy they like. Apparently deciding which boy to kiss is harder than restructuring your entire economic, political and historical perspective. Now, there are dystopian books I LOVE and ADORE in which the heroine is quickly able to come to grips with the fact the All-Knowing Benevolent Government is actually evil and kills kittens with laser-equipped cows or something. But I also wanted to write a book that explored just how difficult it is psychologically to break with what you hold dear. For Madeline, all of that security and rootedness is in the form of her ancestral home, Landry Park. For the third month in a row, Michelle of Galleysmith and I are doing joint review discussions. These are more in-depth than my usual reviews and discuss plot points in a (mostly) non-spoilery way. We've posted about a different book every Thursday, and our last book this month is DUALED. Michelle and I decided to discuss four topics: Genre classification, Unsympathetic main character, Romance, and Worldbuilding. The first two we discuss below, the second two we discuss over at Galleysmith. The city of Kersh may be the last stronghold in a world broken down by the effects of a universal cold vaccine that caused irreversible sterility. Kersh’s board artificially creates two of every child (known as alts) and gives them to separate families. Sometime between 10-20 years of age, the alts are turned active - meaning they have 31 days to kill the other or self-destruct. It is survival of the fittest in its most brutal form. The kids killing kids angle is very reminiscent of THE HUNGER GAMES, though the purpose here is to raise of city of killers ready and willing to fight for Kersh should the unwashed masses dare to storm the gates. But in this first installment at least, the focus is not really on the evils of this society but more on 15 year old West’s questioning her own worth. Is she the best version of herself? Is she the one who deserves to keep living? It’s a fascinating and thought provoking question. Yea, it definitely fits into the dystopia/post-apocalyptic classification for me. More so than some of the other books we’ve read thus far. Like you, I definitely got THE HUNGER GAMES vibe as well. It didn’t really compare from the suspense/drama angle but the kids killing kids scenario was comparable. It did make me wonder if the book was inspired by Collins and if that was a purposeful relationship. It’s definitely a “read-alike” in that I do think it will appeal to some of the same audience. And I think any writer writing a dystopia today admires THE HUNGER GAMES and what it has achieved. In addition to the basic kids killing kids scenario, there are some other big similarities (which we discuss later) but I think DUALED does enough differently to mark its own territory outside the HG box. For sure, I don’t see the comparison as a negative just that it was pretty apparent. The execution was different enough for me and has much potential for more unique qualities in the following book. Ok, so if the central question is if West deserves to keep living more than her alt does, then it does make sense that the reader should be asking themselves that very question. Let me do a quick comparison with THE HUNGER GAMES’ Katniss, because both West and Katniss are forced by their society to become killers lest they be killed - and they both have pretty abrasive personalities. But where Katniss immediately wins the reader’s sympathy with her nobility and passion, West can be downright unlikeable in comparison. She wallows in self-pity, pushes away all offers of help from a very patient (and hot) Chord and becomes a hired assassin on the black market for no apparent reason. (Note: much later on in the novel West explains her motivations for becoming a striker to Chord in a really heartbreaking scene) I felt utter revulsion for some of West’s actions (which I suspect is how the author wanted me to feel) and I know this could be a problem for readers who insist on sympathetic characters. Hmmmm, I didn’t find her wholly unsympathetic as much as just pathetic. I would hazard to say that when comparing any number of female lead characters with Katniss the other would come up FAR short on the awesome scale. It’s almost like comparing apples to oranges really. But, I’ll take a stab at my thoughts on the issues you raise. I agree the similarity in the girls circumstances (forced killing) is there. Unlike you, I did feel sympathy for West pretty early on. She’s lost all of her family and drifting a bit as a result. I viewed that wallowing in self-pity as realistic. Having said that, it got annoying because it went on too long. The pushing Chord away issue was overbearing. I didn’t need to be hit over the head with the idea that she wasn’t safe or good enough for so long. Unlike you, I got why she became an assassin. I do think that this part of the story could have been structured differently to allow for better understanding and a smoother flow. It made sense from the preparedness angle as well as the self-loathing angle. I’m curious to know which actions revolted you. The preparedness angle works at first, but once she’s activated herself, why does she keep taking assassin jobs and avoiding her own alt? That could be where the self-loathing angle comes into play because the killing of other people’s alts is pretty despicable and she knows it. I hated how she killed her first assignment - an innocent girl who just happened to have the misfortune of having an alt who could afford to hire an assassin and who didn’t mind breaking the law (and the Kersh code of honor - however twisted the society is, it is still more honorable to face up to the task yourself than to get someone else to do your dirty work). And in regard to Katniss, I’m only making the comparison because both West and Katniss kill children - which the vast majority of heroines do not have to do, even in this genre. The argument could be made she kept the assassin job in order be better prepared but in the end all of the physical and tactical training she gained as a result of her assignments went to some waste as she avoided her own Alt. It felt somewhat contrived, a reason to keep she and Chord apart, and unnecessary given all the other elements of the story that could have been explored as an alternative. I do think in the end it helped West in achieving her goal versus her Alt. I’ll add I’m not sure why a teacher would encourage that route of preparedness. I wonder if the teacher is playing a more sinister role here. We do get the sense that the striker system is a form of rebellion against the government of Kersh, and if the teacher is encouraging her participation … I think we’ll be seeing more of this play out as the series goes on. 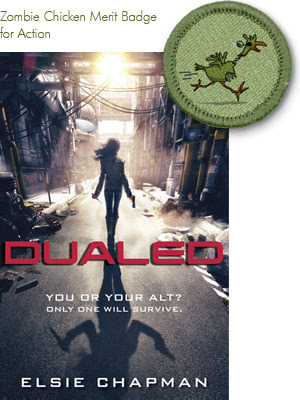 DUALED comes out in hardcover on February 26, 2013. Visit the author's website for more information.